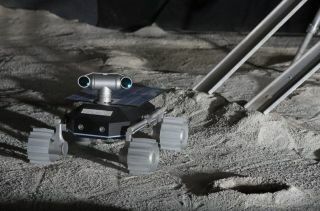 Artist's concept of the Team Indus rover on the moon. There could soon be a whole new definition of the term "moonshine." They are 1 of 25 teams selected from a pool of several thousand entries to compete for a spot aboard a moon lander/rover that's scheduled to launch on Dec. 28, 2017. Team Indus has secured a launch contract from the Indian Space Research Organisation (ISRO) for a booster flight. Team Indus invited researchers who were under 25 years of age to imagine, design and build an experiment that would help humankind develop a sustainable settlement on the moon. In Phase 1 of this "Lab2Moon" challenge, participants were asked to send in a concept note and video of their idea. That call generated 3,000 entries from 15 countries and more than 300 cities across the globe. UCSD brewmasters Johnny Koo, Jared Buchanan, Han Lu Ling, Neeki Ashari, Srivaths Kalyan and Tavish Traut. The competition then entered Phase 2, in which 25 teams were short-listed to build prototypes of their concept to showcase to an international jury of experts in March at the finals in Bangalore, India. Teams from India, Peru, Mexico, the United States, the United Kingdom, Spain and Italy made the cut. Other proposed experiment ideas include the following: radiation shielding using bacteria, effects on plant growth in lunar regolith, sintering of lunar soil, inflatable dome testing and a lunar gene bank for endangered species. In a UCSD press statement, Neeki Ashari, a fifth-year bioengineering student at the school and the team’s PR and operations lead, said, "We all appreciate the craft of beer, and some of us own our own home-brewing kits. When we heard that there was an opportunity to design an experiment that would go up on India’s moon lander, we thought we could combine our hobby with the competition by focusing on the viability of yeast in outer space." ALEiens technology by Team Original Gravity. Brewing beer in space is just one application of this yeast research, Team Original Gravity members said. The experiment would also be important for the development of pharmaceuticals and yeast-containing foods, like bread. "The symbiotic relationship between humans and yeast would no doubt be vital for future colonization of the moon and other planets," team members said when they wrote about their proposed experiment on Team Indus' Lab2Moon website. To view the UCSD Astrobiology Club’s submission for Lab2Moon, go to: https://www.youtube.com/watch?v=rxkeDwJLo_A. Leonard David is author of "Mars: Our Future on the Red Planet," published by National Geographic. The book is a companion to the National Geographic Channel six-part series, "Mars." A longtime writer for Space.com, David has been reporting on the space industry for more than five decades. Follow us @Spacedotcom, Facebook or Google+. Published on Space.com.